Home / Pharma news / Debate: Why do branded medicines cost 30%-90% more than generic medicines? Debate: Why do branded medicines cost 30%-90% more than generic medicines? It is no fact that the price of many similar medicines available in the market differs greatly. While the cheaper ones are collectively referred to as ‘generic’ and the expensive ones called ‘branded’. But why does such disparity in the prices exist when the branded medicine and its generic counterpart have the same salts, active ingredients, and usage? The answer to this question lies in the history of how ‘branded’ medicines came to be. Before the 1960’s the international pharmaceutical industry was much unregulated. The safety, quality and the effectiveness of the medicines in the developed nations was largely unchecked. More often than not the production of medicinal drugs was solely under the supervision of the manufacturers. This gave room to a lot of corner cutting in the production process and medicines which weren’t suitable for market use were sold. Thus, medicines caused more problems than it solved. To make sure that this negligence could be avoided by governmental organizations like FDA, CDSCO etc. came into being to regulate this industry. Now, pharmaceutical companies had to conduct tests to demonstrate how their medicine worked. For this, they engaged in strenuous clinical trials with up to thousands of patients to show the efficiency of the drug used in the medicine which they had made and administered. This trend of evidence-based medicine also encouraged scientific competition between pharmaceuticals. To get their medicine approved, companies conducted tests, made reports at every stage and sent them to the regulatory bodies. Today, inventing and patenting a new drug is costlier than ever. It is estimated that pharmaceutical groups can spend up to $5 billion just to create a new drug based medicine. Therefore, the reason behind why brand – name drugs are typically more expensive is fundamental – the companies are seeking to recover the money spent. The initial high costs of developing, researching and, testing a brand new drug along with the marketing and selling push companies to price their medicines at a high, making their products ‘branded’. Simply, if there are no profits made, there will be no R & D and eventually, no new medicines. Another reason why branded drugs are comparatively expensive is that creating their generic substitute is far more cost-effective. A pharmaceutical company which is developing a new drug would file a patent that prohibits other manufacturers from reproducing or selling their medication in any form or way for a set time period. Other manufacturers are only allowed to produce the generics after the patent and exclusivity rights have expired. The developer companies have to patent their medicinal drug they aim to use, not when it hits the market but when it is developed in the lab. Also, these patents are only viable for a period of 20 years, after which any drug manufacturer can apply to the regulatory bodies to sell the generic version of said the brand name medicine. The manufacturers need only do bio-equivalence tests (to prove that the generic version of the medicine works just as well as the original patented one) and bio-availability tests (to ensure that the active ingredient used in the generic version is same as the one provided by the original molecule) before they start marketing and selling the generic medicines. BE and BA studies usually require smaller sizes of volunteers, just up to hundred and therefore, their costs are much lower than full-fledged clinical trials. As the manufacturers don’t have to spend as much as the pharmaceutical giants to roll out these drugs into the market, generic drugs are comparatively cheaper. 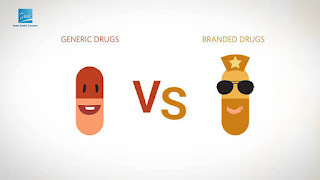 Basically, the words ‘branded’ and ‘generic’ are not used to differentiate between medicines on the basis of their components, dosage or potency, since both the variants are perpetually similar. Therefore, the misconception that branded drugs are more effective and better is baseless. Generic medicines also go through quality control and manufacturers have to give reports of their BE and BA tests to prove their efficacy and the fact that they are as potent as their branded counterparts. The real differentiation between the terms lies in the way in which they are being sold.